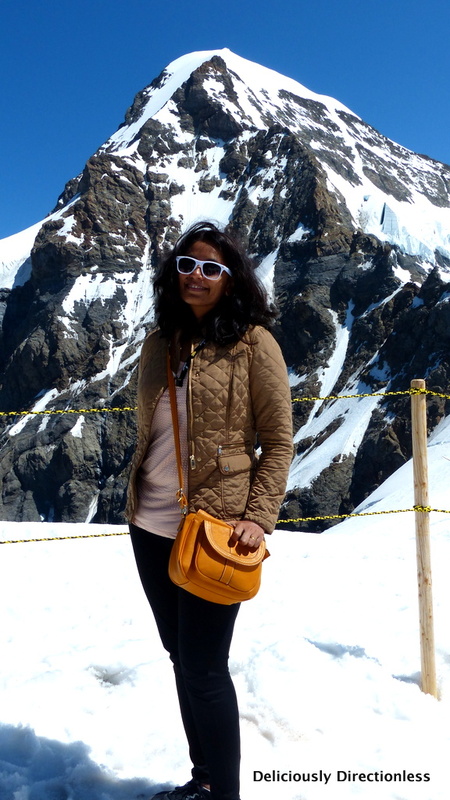 Earlier this month I was travelling in Switzerland and I had the chance to be on the top of Europe! 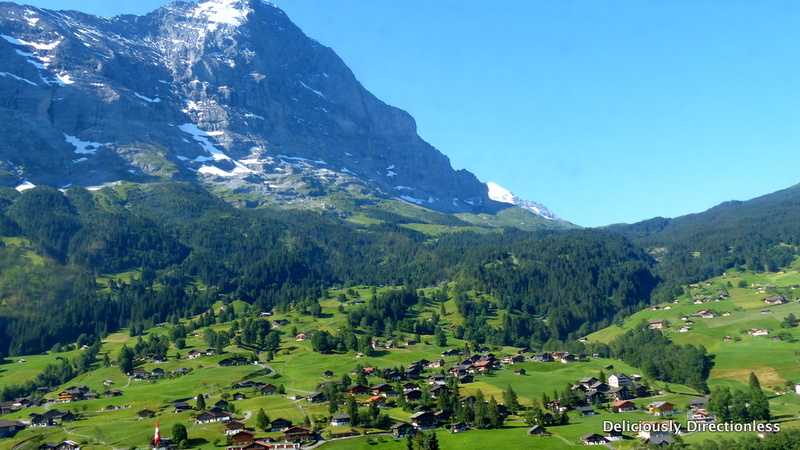 Jungfrau is the most distinctive of the Swiss Alps, and along with Eiger and Mönch forms a spectacular wall of snow-clad peaks, interspersed with glaciers. Jungfraujoch is a saddle between the two peaks, Jungfrau and Mönch, and the Jungfraujoch railway station is the highest one at Europe – at a staggering elevation of 3,454 metres or 11,332 feet. I was a part of an international media delegation, invited to witness a unique sports event. 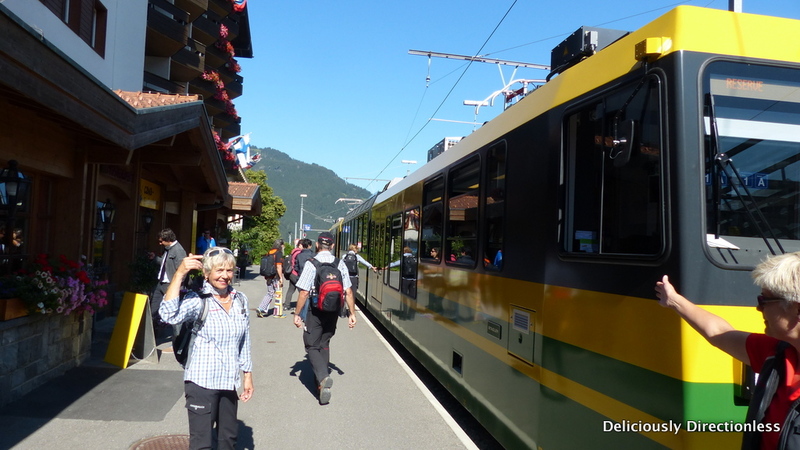 We had to change three trains to get to the top – from Interlaken to Grindelwald, from Grindelwald to Kleine Scheidegg and finally onwards to Jungfraujoch. On the way, there were gorgeous views of picture-perfect villages, grazing cows (I love watching cows & sheep grazing…), and soaring mountains. 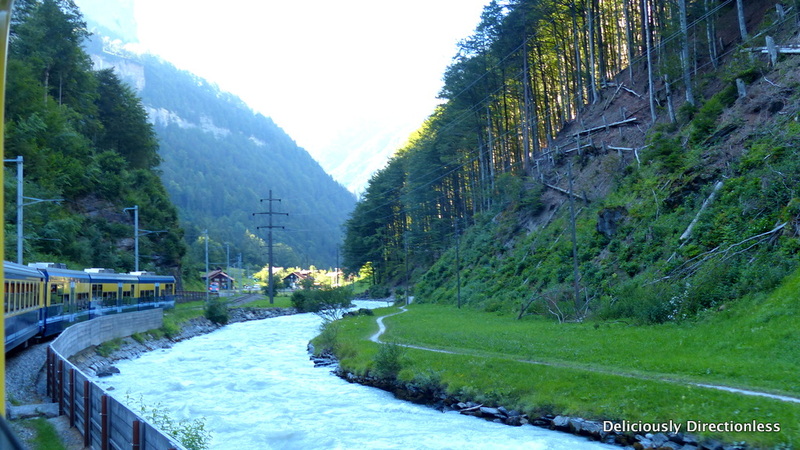 The last leg of the journey was partly underground, through a tunnel that bores through Eiger and Mönch. 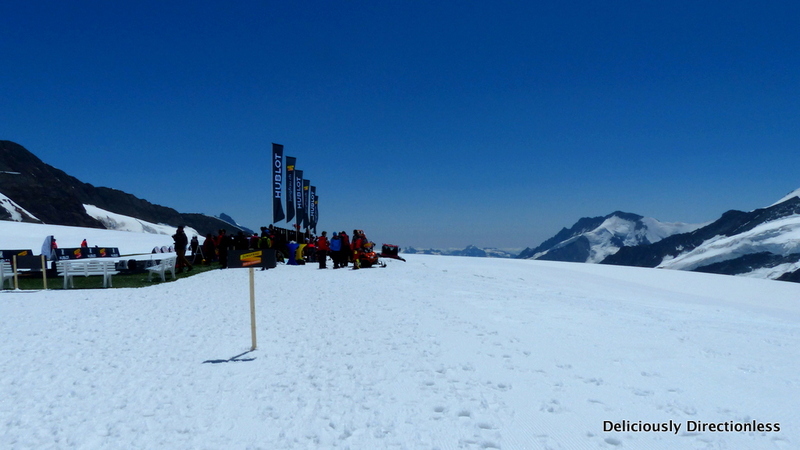 There were stops on the way and I could see Jungfrau looming closer, and wide expanse of snowy plains all around. It was biting cold in the tunnel and I was glad to step out in the relatively warmer assembly point at the station. 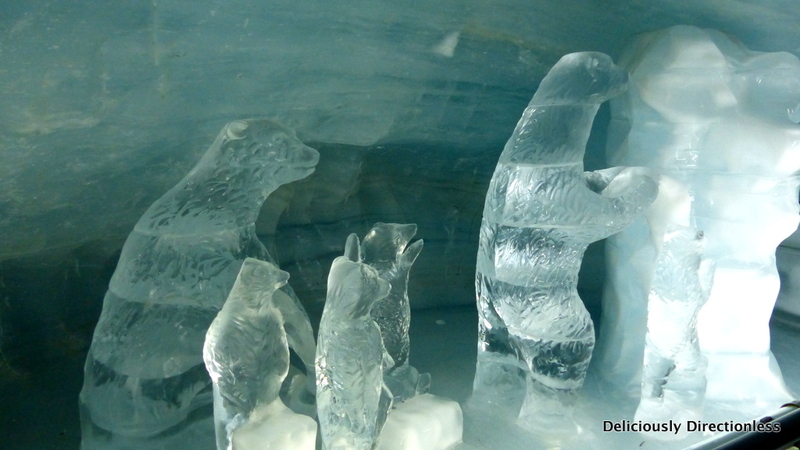 From there we were taken for a walk through an icy tunnel, lined with some ice sculptures. It was a rather slippery walk and I was clutching the handrail all the way! 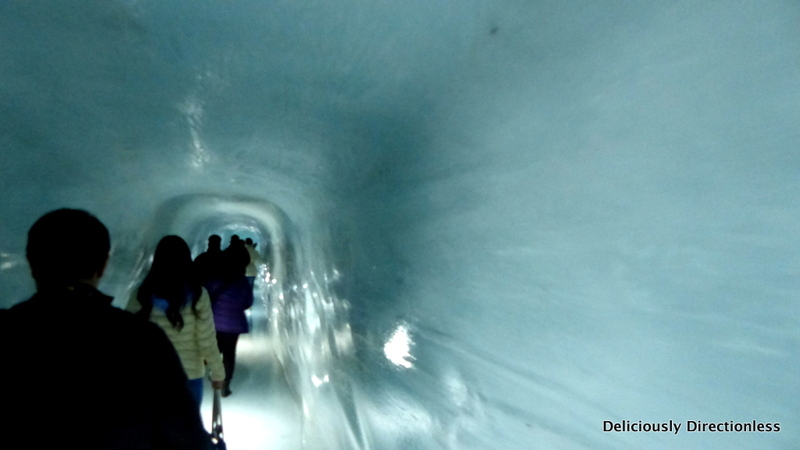 From ice, we stepped outside into the soft snow of Jungfraujoch. It was a brilliantly sunny day, and though it was cold, the sun’s warmth was welcoming. After giving us some time to take pictures, we were ushered onwards to the Aletsch glacier where the sports event was to take place. 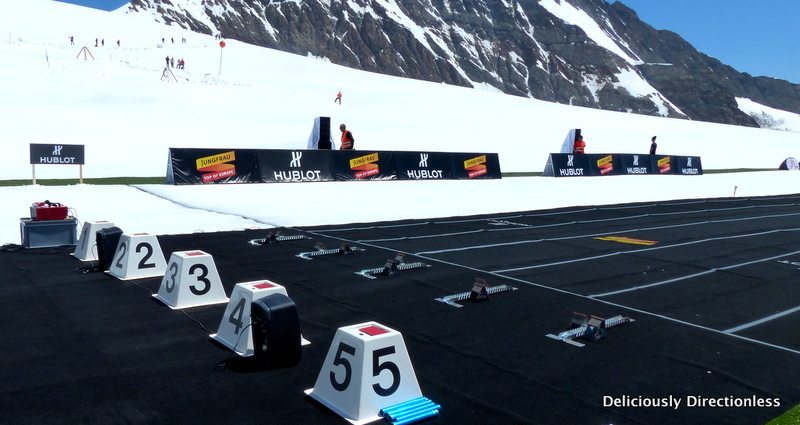 A turf was laid out on the flat part of the glacier and next to it was a tartan race track. 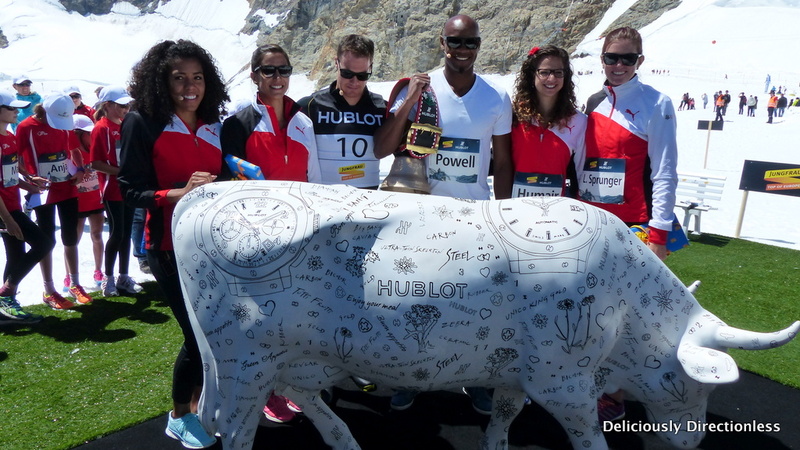 The event was co-sponsored by Hublot & Jungfrau Railways, and was an exhibition race between two great athletes – Asafa Powell (the Jamaican former world record holder in 100 metres sprint, an Olympic champion, and one of the fastest men in the world) and Dario Cologna (Swiss cross-country skier with several Olympic golds and World Cups under his belt). 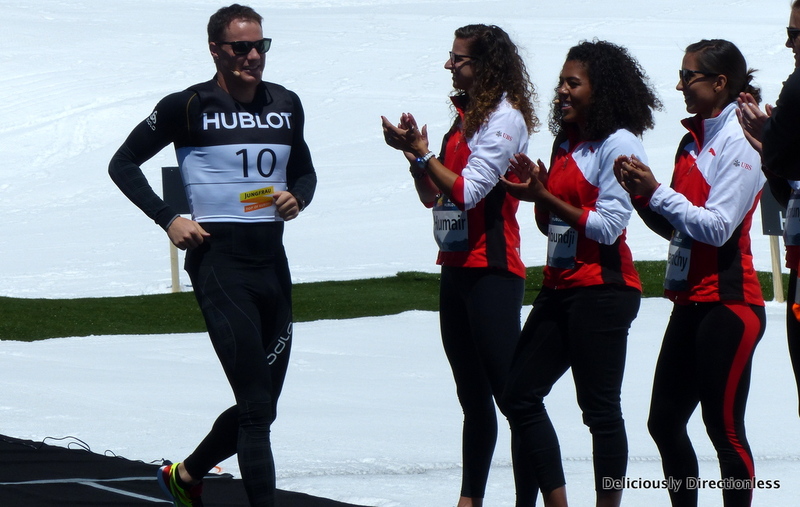 And it was no ordinary race – Powell was going to sprint down the track and Cologna was going to ski alongside! 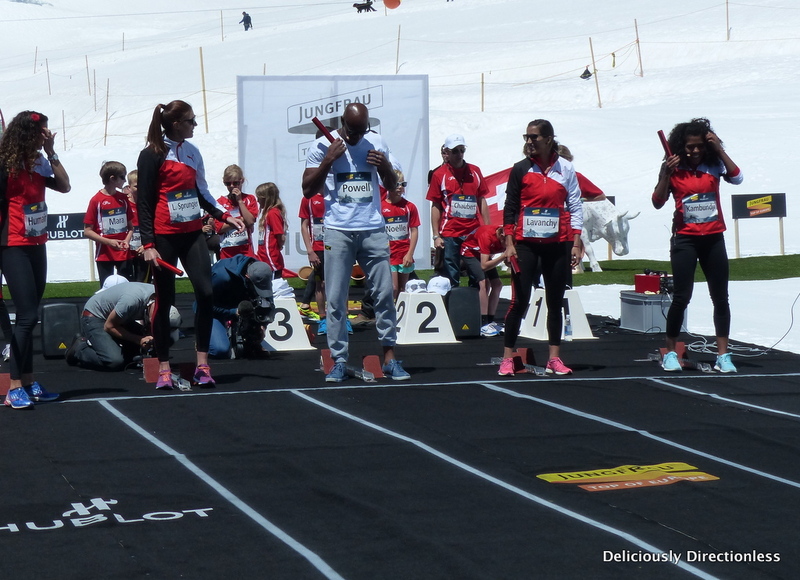 The event began with a relay race, with Powell and the Swiss Women’s 4 X 100 metre relay competing with each other, along with schoolchildren. It was fun watching these amazing athletes run and also coach the young kids along. 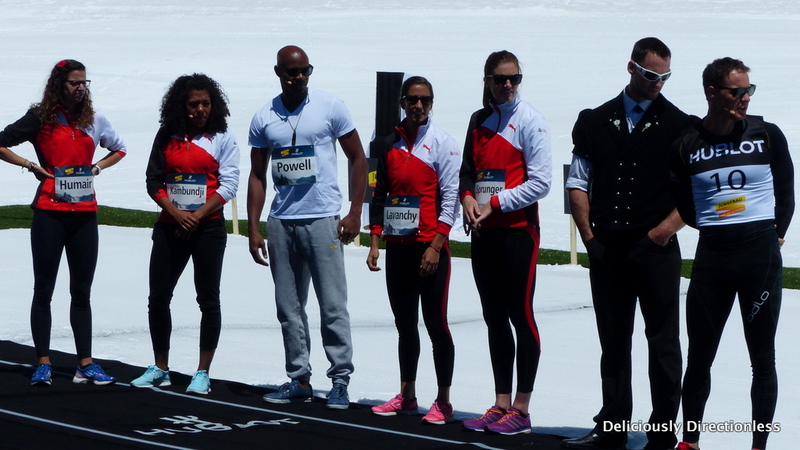 It was almost time for the main event to begin (and the Swiss are sticklers for time! 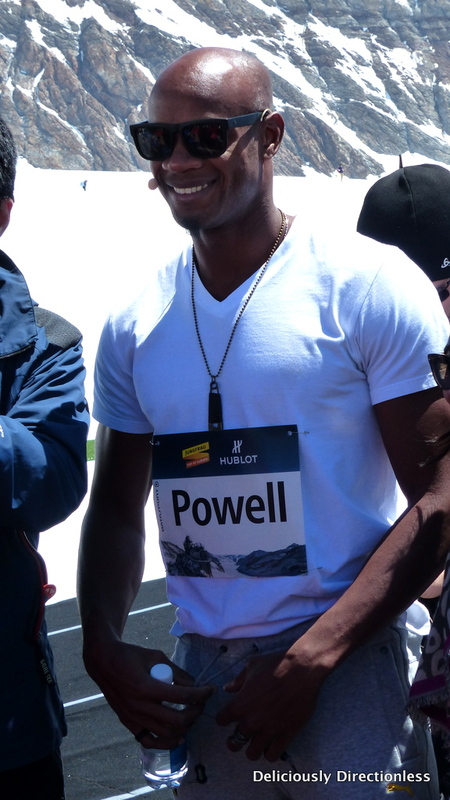 ), so Powell did a few practice runs and Cologna tested out the ski terrain. The Swiss wrestler Kilian Wenger fired the start pistol and the two men were off! Powell zipped by like a bullet, but Cologna rapidly caught up with him and it was a photo-finish at the end. 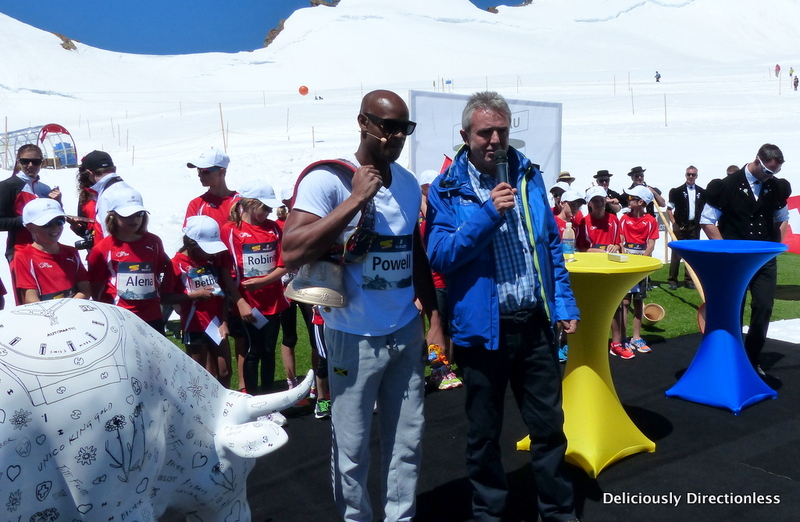 The prize distribution was done by Urs Kessler, CEO of Jungfrau Railways. After the ceremony, Wenger challenged Powell to an impromptu arm wrestling match. Powell was no match for the burly wrestler and was defeated in seconds! 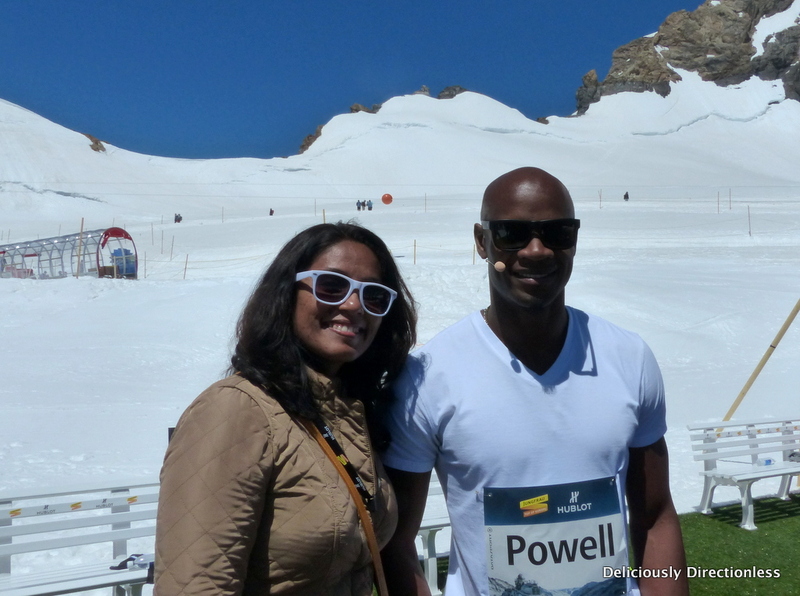 After the press conference, I managed to get a picture taken with Asafa Powell! A pic to cherish, eh? The event was followed by a Champagne lunch (I love my job!) on the glacier. 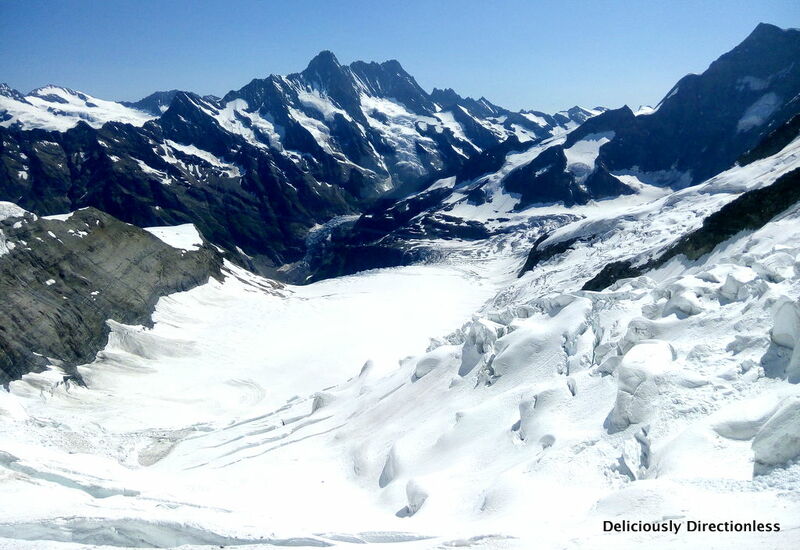 There are of course, several restaurants at Jungfraujoch, including an Indian one called Bollywood (open April to October). There’s also a “Lindt Swiss Chocolate Heaven”, which opened last year. You can get a virtual tour of the chocolate-making process and also buy your fill of chocolates. 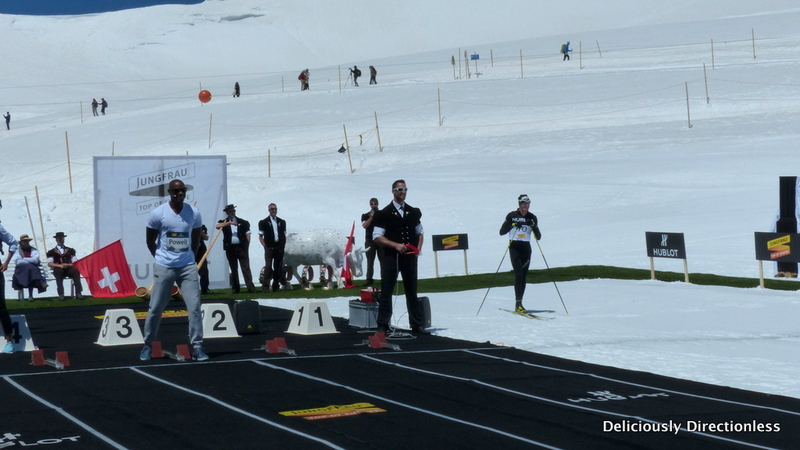 It was a fantastic experience on the top of Europe – a unique sports event, the chance to meet world-class athletes, great food and a stunning setting! What more can you ask for?! 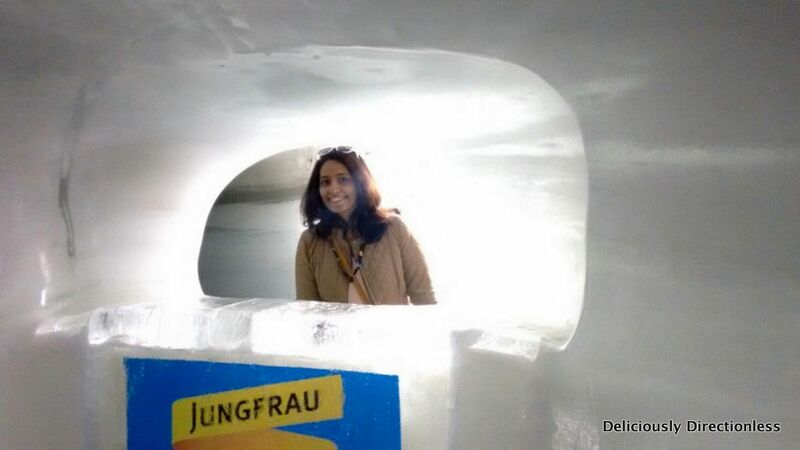 All details about Jungfrau, the railways and the experiences here. 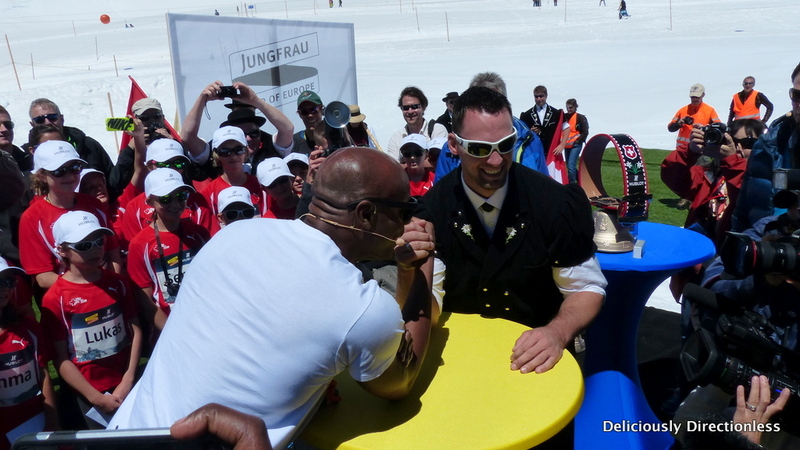 Disclosure: I was invited by Jungfrau Railways for this event. New Year Resolutions worth making + a Contest!